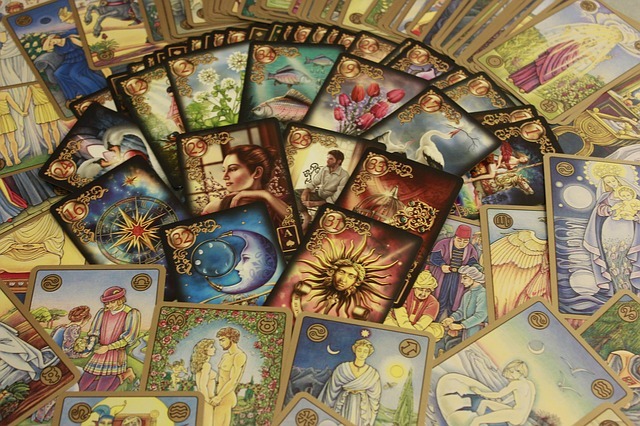 Using the Ryder Waite cards are the easiest because there are so many books that depict the pictures on the cards. But, if u have something else, u can still use them. THE MINOR CARDS consist of 56 cards. These tell of everyday life events. Before reading ask for divine guidance to clear any negativity. Ask for the pure, holy golden white light of our Creator. Now to learn these in a easy manner, take all of your minor arcana cards and starting with the aces separate them into 4’s. Put your 4 aces together. So, u would have the ace of cups, the ace of pentacles, the ace of wands and the ace of swords together. Do this with the 2’s in the deck…the 2 of cups, the 2 of pentacles, the two of wands and the 2 of swords etc. This will take a while to do but, it is very helpful in the long run. After separating them this way…look at what all aces represent…new beginnings. Think of its meaning. The cups would mean new beginnings of something emotional, then ace of wands….it would mean new beginnings of something regarding personal growth or business. Go thru them learn them by this method. (I only did a few and got the general idea). When learning the above meanings of the suits and the numbers, you are off and running. Practice with these cards. After studying them shuffle them and mix them up. Then do a reading with them and see what u have learned. A good spread to do for these as a beginner is past,present and future. Shuffle the cards, then lay out 3 cards to represent past, present and future. Say u put down an ACE OF CUPS, a FOUR OF WANDS and a NINE OF SWORDS. Now reading them as past, present and future what would u get out of these? .MARIE'S CORNER 2 Career Choices ANGEL ORACLES BLOG Career / Love / General Advice Career / Message From Spirit Guides CAROLYN'S CORNER Children / Life Purpose Choose a Card Reading 09292015 Contemplating Between and Ex and New Love Dealing With Negativity on a Spiritual Path Expectations of People - It's OK to Say No Explanation of Creation/Manifestation - Simplified! Finding Love FRIENDSHIP GENERAL How to Cleanse Crystals If Someone Will Contact You Again LIFE AND LOVE PATH WEEKLY MESSAGES LOVE New Relationship and Issue With a Friend Relationship Problems Relationship Problems and Outcome SPIRITUALITY AND ASCENSION - SIMPLIFIED! Stay With Partner or Someone New Stuck in the Past Torn Between 2 Loves Uncategorized Universal Law of Expectation When Will I Find Love?